ROI? Yes. We Can Track That. Your community. They support you. They cheer you on. They share about what you’re doing to make the world a better place. They buy your products and services. And…they’re talking about you even if you’re not present. So why do you executives have such a hard time getting behind social media intiatives? I’m pretty sure a kitten dies every time the phrase is even uttered. So if you care about kittens at all…stop using this as your reason for not investing in healthy, vibrant online community. 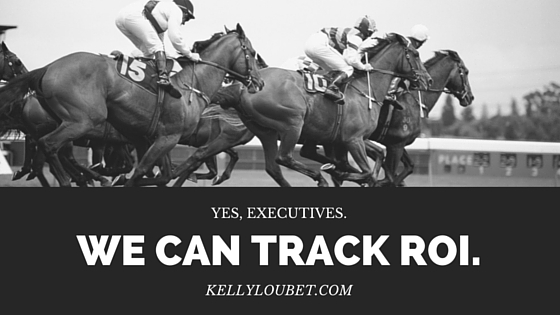 The truth is- there are many ways to track the ROI. And there are many ways to interpret what ROI means within your organization. Being the source of knowledge in your field keeps you top of mind to consumers. They may not be in the market for a new (insert product here) yet, but when they are, YOU are who they’ll come to first. Why? Because you’ve created a digital community with relevant and sometimes entertaining content. You engage with your community and you show that you care when something goes wrong. What’s the value of that? It’s invaluable. Once a consumer begins to make their way down the sales funnel – it is possible to track. There are tons of tools out there that will document the customer journey down to a single tweet. This journey can be segmented too. Are you having a sale on gold bracelets? There are technologies that will allow you to see who opened your last email with gold braceletes as the header image. Now you’re tracking gold-loving customers. Being able to segment your online customers and tailor individual messages through not only email, but also social media, use to be a pipe dream. Now it’s a trackable reality. So let me ask again – Why do executives have such a hard time getting behind social media initiatives? Brands that aren’t investing in building their online community are falling further behind each day. Not only do customers expect you to respond via social media but they now expect service along every step of the buying process. Customers want a personal relationship with their favorite brands. And – if you’re not talking with them, they’re still talking about you. Don’t you want to be there to support that? Executives – get on board. Enlist the help of a specialist, not a random intern. Start building your online community. If you already have an online presence, improve it. Grow it. Show your customer that you’re there for them. You may not be able to track the value of their respect for you, but you can track the end result of the journey. *Note- My original post was published on the Creation Agency blog on 2/24/16. I’ve been on a bit of a hiatus. If you follow me on any of my social channels, you’ve surely seen that the love of my life has been battling cancer. That has nothing to do with this post, but I wanted to share with you why there’s been such a gap in my writing. You know… be human with you. And treat you as actual real humans. Now THAT is exactly what this post is about. 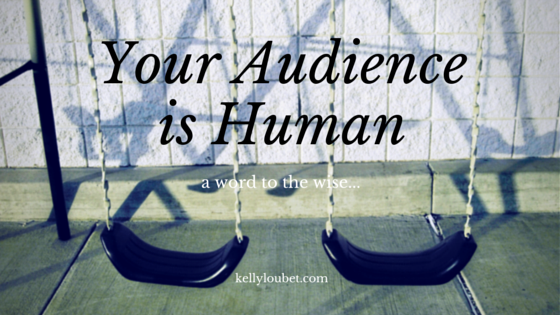 Your audience is human. My audience is human. There is an actual person in front of the screen reading our content. So often, I feel like that this simple truth gets lost in marketing. Sellers get so consumed in pushing their product that they forget a real person is on the other end. And by forgetting who the audience is… the message is delivered in the wrong way. When you think of your marketing plan, think of your best friend. You wouldn’t shout and wave your arms around like a crazy person to force your best friend to listen to you. You wouldn’t invite your best friend over on false pretenses just to get them in front of you for a few minutes. You certainly wouldn’t show up at the places your best friend hangs out in order to ambush them. No. That’s called stalking. Your best friend would likely break it off, call the police and get a restraining order! But those are exactly the steps that many marketers are taking in order to reach an audience. They treat social media as a megaphone rather than as a 2 way conversation. They bait their audience with juicy links and promises of something amazing… only to find content of a different kind. And they invade the space of others by talking at them instead of with them on personal social channels. I’m not saying that you can’t strike up organic conversations with your customers on their personal social channels. I’ve made some of the most valuable relationships by simply conversing with people I’m interested in. But a conversation is just that. It’s a conversation. Until something more meaningful develops… don’t sell that person. Relationships of substance and of trust take some time. I guess what I’m saying is. Your marketing tactics aren’t just going out into the Universe. They’re landing in front of real people. Human beings. Give them a reason to want to know more about you. Don’t give them a reason to file a restraining order. Next on the agenda? A fireside chat (not really because it’s hotter than the gates of hell in Phoenix right now) with Mayor Greg Stanton. The Phoenix Mayor is incredibly social! Find out how he utilizes social media and why he feels it’s an important way to reach the people. I think I’m most looking forward to the session with Kevin Spidel, Director of Voice Media Group. He’ll be sharing some of his favorite social engagement tools and the power of gamification. That’s a scary word for some brands, but gamification could be just what your brand needs to create an army of active loyalists! 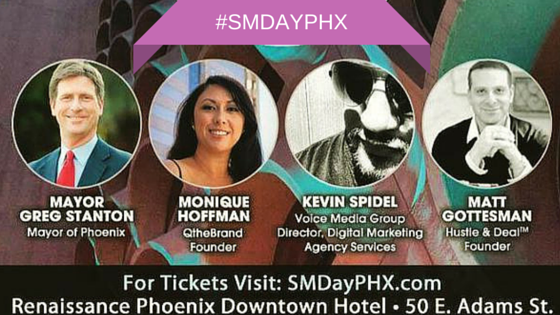 There’s also a panel with some of Phoenix’s most influential social media users. I’d hate to forget to mention that the Social Media Club of Phoenix is coming back in full force after being in hibernation for a couple of years. Vincent Orleck, Social Media Manager at Plexus Worldwide, took on the task of President and is reviving the club. Club members (including me) will be on hand to invite new members to join up and participate! I’ve taken on the role of Director of Partnerships and would love to talk to some of Phoenix’s brightest small business owners! So… step right up and let’s chat! Does Social Listening Really Matter? This is a real question that I was really asked. Does social listening really matter? Uh… YES! 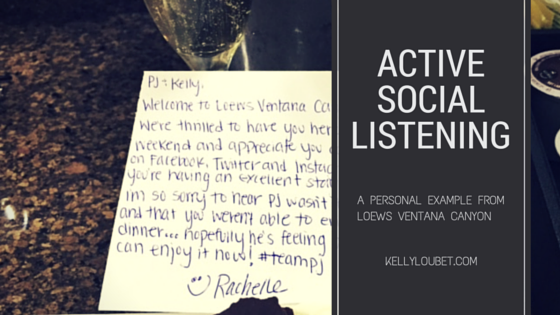 Social listening is one of the most under utilized tools in the marketer’s toolbox. It’s more than just replying to @ messages or following hashtags. It’s actively listening, participating in the conversation, and then acting on that conversation- creating a relationship. Let me give you the perfect example. My fiancé and I took a weekend staycation at Loews Ventana Canyon Resort in Tucson, AZ. He was recently diagnosed with a rare form of Non-Hodgkins Lymphoma and we thought the trip might be a nice way to get a change of scenery from the hospital. While vacationing, we took pictures and I tweeted and used Instagram as anyone would. One night we were at dinner and my fiancé, PJ, started to feel sick. He had to leave before our meal arrived. I was heartbroken for him. For us. Our waiter was amazing and had everything sent up to our room-including the wine. I did forget to order dessert however and while I did tweet the resort about our experience with the waiter… I also tweeted how glad I was that I packed some Teddy Grahams to satisfy our sweet tooth. The next night… to our great surprise… there was a knock at the door and in came a bottle of champagne and dessert for two. There was also a note from Rachelle, on the Loews social media team. She thanked us for connecting with them on social media and wished PJ well. Not only that- but they also tweeted him well wishes using #teampj to cheer him on in his fight with this cancer. I’m sharing this vacation experience with you to demonstrate a very important point. Because of our experience with the staff and then the social media team at Loews… we will be seeking out a Loews resort for all of our travels. Not only have they created loyal customers in us… but I also shared my love for Loews with my own social media following. This gave Loews some additional visibility among my circle of friends and readers. Being that I’m a social marketer myself- I can now also take this lesson and make sure that I’m applying it to my own client’s communities. Loews doesn’t just respond to tweets and follow hashtags. They participate in the conversation. They take additional action when it’s called for. They develop long lasting relationships. And for that… I thank them! Networking really is everything. The people you know and connect with are the most important resources you have. But it’s not all about getting. It’s about giving. I didn’t even realize what an extensive network of real people I had until recently. I know… all people are real people. But I’m talking about a network of people who will truly go to bat for me. How did I acquire this network? By giving. The people in my network don’t owe me any favors. I didn’t give out help in hopes of getting some back. Giving to your community should come from the true desire to help. This doesn’t mean to sell yourself short or to give out advice you’d normally charge for. It means- when someone in your network asks you for a hand up in a genuine way… you help. When a newbie in the space asks you an easily answered question… you answer. When someone in your network is celebrating a big win… you celebrate with them. That’s all. Soon enough… you’ll find that all of your natural goodness has produced a network of kind and helpful people. Networking has gotten me every job worth talking about. It’s gotten me invited to places I feel like I had no business being. And most importantly… it’s connected me with people I look up to and learn from on a daily basis. 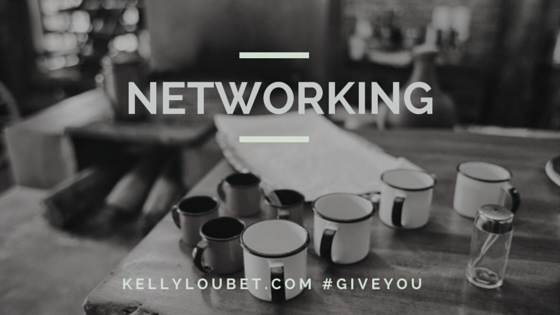 So… today, I challenge you to change the way you look at your current network. Get out there and do some social good for no reason at all, other than to see your peers grow and flourish. Eventually… it comes back around a million times over and when you least expected it to.